Last year, Cirqle launched as a collection-focused way to collaborate and share photos and videos. The latest update, version 2.0, adds a new feature that could help it stand out from the growing number of Instagram clones: A way to connect with other devices without internet access, by making a direct Bluetooth connection. In the latest version, instead of radioing back to a centralized application, Cirqle can use Bluetooth in close range to invite other members to a Cirqle or collaborate together, even without internet connectivity. It’s easy to see it being useful at events like Burning Man or a music festival, but as FireChat’s recent popularity during the demonstrations in Hong Kong highlights, there are more serious scenarios where an off-grid social network can come in handy. Aside from off-grid networking, the biggest improvement for users in the latest version is a much simplified feed. Now you can look at a single Cirqle by scrolling down, and flip through various Cirqles by flipping right or left. The first version of Cirqle had too many buttons and options; version 2.0 is significantly streamlined. Another nifty feature is that Cirqle can now take a look at your camera roll, and by analyzing timestamps and geolocation data, automatically organize your photos into Cirqles that make sense. Although Cirqle’s founders are Russian, the app is developed in the United States and Europe as well. Cirqle is bootstrapped and hasn’t received VC funding yet. 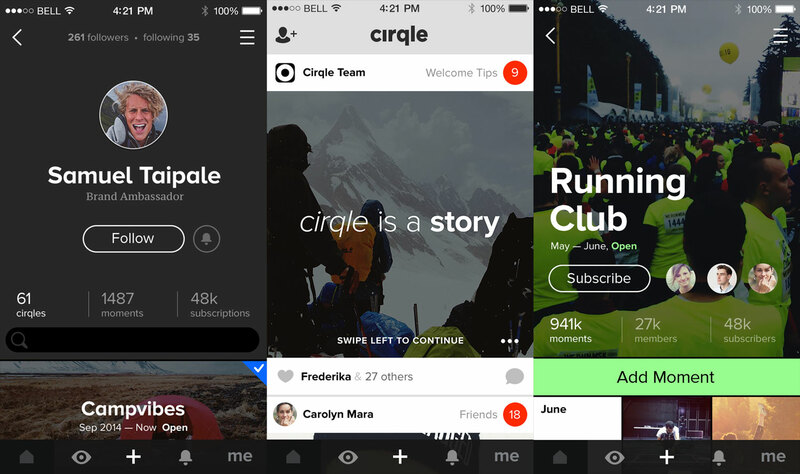 Cirqle is a free download for iOS, and the latest version will become available later today.